Meet our high school interns: Fatima and Jamil! Fatima, Urban Assembly HS for Emergency Management, and Jamil, Urban Assembly HS – Bronx Academy of Letters, take tree readings at the Park. For the past two summers, we have welcomed a group of high school interns to the Park as part of Urban Assembly's Summer High School Internship Program. Urban Assembly, a New York City-based non-profit, offers students placement in internships that help them explore a career interest, and gain real experience in the workplace. Left to right: Director of Visitor Services, Lizette DeJesus, Fatima, Jamil, and Park Operations Manager, Angela Stangenberg. For us, it's a great opportunity to work with a group of young people who bring new ideas and a fresh perspective to the Park. Over the past four weeks, Park staff has worked with Fatima and Jamil on a variety of different projects from horticulture (gardening, gardening, weeding, mulching, watering, tree readings), to public programming (implementing art workshops, monitoring health and wellness class sign ups) to retail (helping with mid-year inventory of retail stop and restocking) and more. 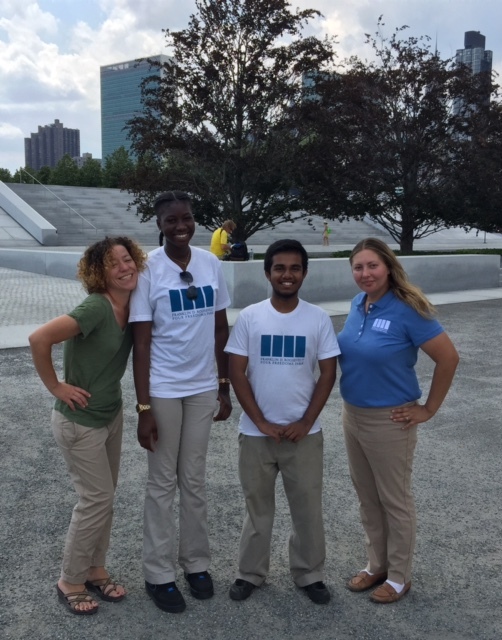 Today, our high school interns take over our Instagram account (@4freedomspark)! Check out our Instagram feed for a glimpse of the Park through their eyes. We'll repost these photos on our blog next week! Fatima in front of the Four Freedoms inscription. Hi my name is Fatima Gaye! I am 15 years old and am going to be 16 in a few days! I go to school in Brooklyn Bridge City Hall. It is called Urban Assembly School for Emergency Management. I’m going into 11th grade on my way to becoming a junior. After high school I want to attend Stony Brook University to become a doctor (pediatrician). The reason why I chose this college is because it has a really good medical program. I’m also an intern at Four Freedoms Park Conservancy. Ms. Oliver, the partnership coordinator at my school, recommended that I apply for a program called Urban Assembly Internship Program. I applied for the program and got in, then got an interview with Lizette, because I was interested in learning something new and Franklin D. Roosevelt was one of my favorite presidents. Thanks to Lizette and Ms. Oliver, I had something to keep me busy for the summer! My favorite thing about interning at Four Freedoms Park Conservancy is that I’m meeting new people, which I enjoy because in meeting people from different places that have experienced different things, I can learn something new. On my first day interning at Four Freedoms Park I met an older man named John who was alive during the same time period that Franklin D. Roosevelt was president. He started telling me about how many things Roosevelt did when he was a president and that without him we wouldn’t have Social Security or Medicare. It is really great to meet people and learn more about were they came from and what they experienced. The Four Freedoms is a speech that Franklin D. Roosevelt made on January 6, 1941. To me, I find this speech and the four freedoms very inspiring because FDR influenced people to go to war so that we can have freedom. Jamil and Fatima with their supervisor, Lizette DeJesus. As of May 4th, 1999, I was born into this vast world as Jamil Ahmed. Being born into a crowded family of four sisters and two hardworking parents, my childhood was made memorable by the notion that I will one day be more successful as the people who brought me up (sounds harsh, I know). Now, at 16 years of age, the idea itself doesn’t seem as drastic. Every move I make, every opportunity that I am able to grasp leads me to become a little bit more successful in life than I was the previous day. People may think that the whole year is ripe for picking, that there are opportunities popping up as if they’re some sort of abundant resource. I believe, however, that summer vacation is the best time to shine. While the majority of teenagers decide to party around the whole summer, I’d prefer to take up an opportunity to better myself academically. What program did I decide to join the summer of 2015? I’ve joined the Four Freedoms Park Conservancy. Through my school’s enrichment coordinator, I found out about the Urban Assembly Internship Program. Since I myself go to an Urban Assembly school (U.A Bronx Academy of Letters), I found it to be the perfect chance to gain working experience, and to build up a better resume. Now, although the park (and Roosevelt Island) has an extremely rich history, I was more focused on the scientific aspects of the park: the dendrology. Relating to the study of trees, the reason I was so interested about the program is because, after finishing high school I want to pursue a career in biochemistry. Though they may seem nowhere related to each other, trees can actually be used to show how certain proteins are related and when they came into existence. Now, exactly what part about this internship do I enjoy? The coworkers, the environment, the community that makes the Conservancy feel like a home. Everybody works as a team in order to protect, preserve, and honor the Four Freedoms. As an individual, I wish to honor the Four Freedoms because every human deserves freedom. They deserve the freedom of worship, of speech, from want, and from fear. To me, the four freedoms represent the possibility of a utopian society in which everyone lives together in peace and harmony. It means that there will always be a chance for world peace, and it means that we, as human beings, have the power to achieve it.